Don't see any problem about connecting HDD (under screen) LED, at least if WDC hdd is used. Pin 39 (DASP) on PATA connector can be connected to SATA power pin 11. Both are active-low signals, so there is no need for any glue logic. 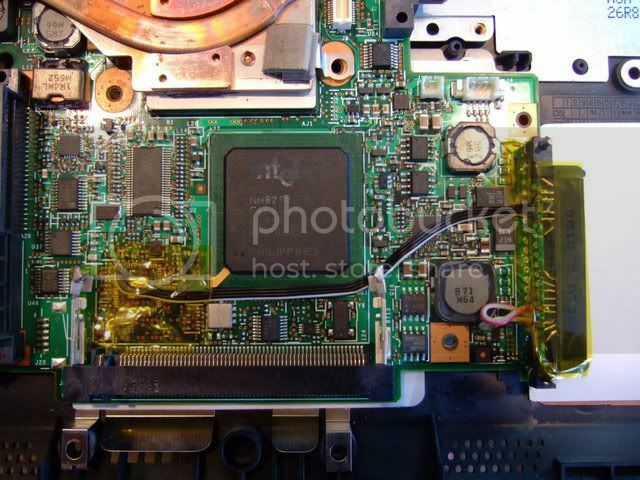 I have top R52 (15" 1400x1050 SXGA+) model that have same motherboard as T43, and was thinking about some other way of enabling SATA (http://forum.thinkpads.com/viewtopic.php?f=5&t=91489). But it's not possible. I was considering a t60 but chose a t43p as all the affordable t60s had horrible inte graphics and I feel that the design of the t4x series is much more appealing. Things about 2010 error and this modification are not clear to me, because on (other) pictures with new sata hdd, 2010 eror is present. So if the ThinkPad T43 have 2010 bios, and it's updated with new sata hdd (with or without removing pata/sata bridge) 2010 error is present or not? jazz: I guess that SATA HDDs from Lenovo with P/N won't trigger the 2010 Error instead of retail SATA drives. However there is a solution to eliminate 2010 error, check my sig. jazz wrote: Things about 2010 error and this modification are not clear to me, because on (other) pictures with new sata hdd, 2010 eror is present. So if the ThinkPad T43 have 2010 bios, and it's updated with new sata hdd (with or without removing pata/sata bridge) 2010 error is present or not? you are correct - I re-flashed the stock BIOS just to see and the 2010 error IS present. However the modified BIOS posted in Lukee's signature works perfectly to solve the issue, and there are absolutely no performance drags from it. Also SATALED pin (AC19) from chipset (active low) can be used for hdd led, without any glue logic. 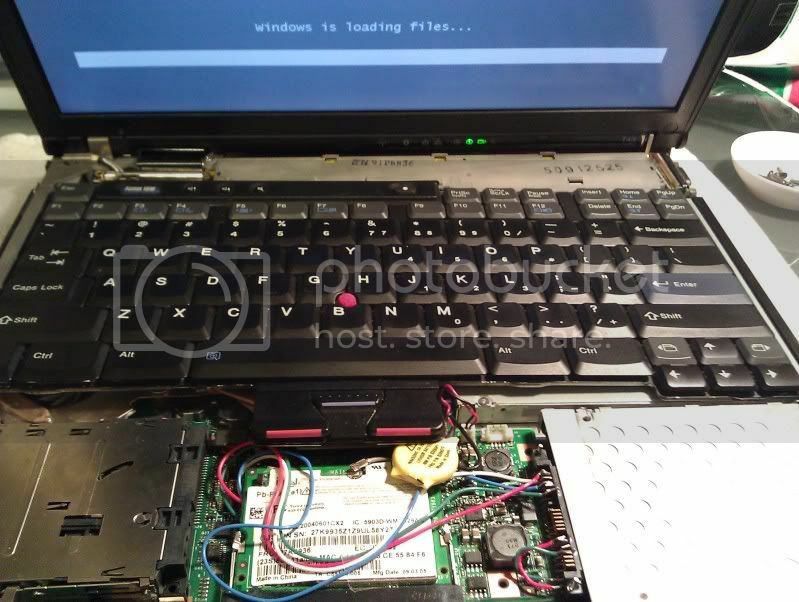 Didn't know about 2010 BIOS patch, and that are some tools for playing with ThinkPad BIOS exists. Have some experience in reverse engineering, and know PC assembler more than good, so will try one day to see what is going on with another SATA channel, that is disabled on some way in ThinkPad BIOS. The pin layout seems to be identical to the Marvell chip. did anyone connect the HD-LED for the SATA drive? Seems to be IDE-pin 39 to SATA-pin 11. There also must be a direct possibility from the Southbridge-chip to SATA-pin 11, but haven't found the connector yet. Last edited by RealBlackStuff on Sat Aug 04, 2012 4:25 pm, edited 1 time in total. When you remove the IDE connector, leave the metal studs. Then modify the long end of the connector (left on my first larger picture in amy first post in this thread) by drilling a matching hole for the stud and sawing off the rest. You need some spacers to lift the connector off the mobo, but a SATA hard drive will then fit exactly in place of the old IDE drive. Last edited by RealBlackStuff on Thu Apr 07, 2011 4:44 pm, edited 2 times in total. Nice job RBS ... looks professional. I am thinking there might be a market for T43 boards with this feature. it took me nearly 5 days to gather all my courage to blast that chip with a second-hand 1200W heatgun. Total time spent on it: maybe 1 hour. The white/black wires from chip to SATA-connector were cut from an 80-wire IDE cable. The copperwire inside is thin enough to go through the mobo-holes near the former chip. This is good stuff. Can't wait to get my supplies. Can you take a pic of your mod but with bigger zoooooom on the most-interested-us areas? Check the pictures in Bibin's posts at the beginning of this thread. They have all the details you require. My connections have all been covered now with (amber-colored) Kapton tape, which I am NOT going to remove. Oh man, this board is a lot smaller than it appears in pictures, haha, this is going to be interesting. I have got everything handled except for the exact places to solder the wires on the sata adapter (I bought the same exact one as RealBlackStuff). RBS, if you could help me out and tell me which wire is soldered to what on the adapter, I would greatly appreciate it. I don't feel safe just guessing from the picture. Isn't it possible to get connectors that slide on to the back of the adapter instead, or is there a specific reason why you just soldered directly? I've been trying to look up pin layouts to do it myself but I'm hoping you don't mind helping me out. Thanks a ton either way. The info is all there in this thread. You only need one Ground and one +5V connection (any, or 2 or all of the 3 within the group). +5V I used coming from former IDE pin 42 off the mobo. I removed several pins from 'my' SATA connector (since you don't need them all) for easier soldering. And I picked my SATA connector only because it was the cheapest/nearest available from a US seller on eBay. Turned out to be the perfect pick (for me). Why bother with an extra connector? It only increases the chances for something not working. And I doubt if there is space for it, or that it even exists. RealBlackStuff wrote: The info is all there in this thread. Thanks, I missed that picture, that's all I needed. As for the connectors... I bought the exact same one as you - that's not what I meant. There are connectors that you can just clamp the wires in and plug them in to the sata interface instead. I'll post a picture when I'm done so you know what I mean. There is no extra space taken up by doing this. Oh, and I also meant to ask if the IDE connect is plugged in to the board so I can just pry it off or is it soldered / glued on. EDIT: By the way, I'm not bashing what you did, I only hope mine turns out half as clean. I was simply wondering if you had tried the connectors instead of soldering to the back of the sata piece itself and found some issue before I did it and wasted time and effort. I used a pair of pliers and just crushed the black plastic from the old IDE connector (held in place by the soldered contacts). Then used a soldering iron to remove the 44 old pins. Theoretically you can cut them all of with a small wire cutter, but unsoldering them looks a lot neater. You can probably use loose connector plugs, but my solution allows for swapping disks without having to dismantle the laptop. That first picture is incorrect, looking back on it. Look at http://pinouts.ru/HD/serialATA_pinout.shtml for a more accurate picture. RealBlackStuff wrote: I used a pair of pliers and just crushed the black plastic from the old IDE connector (held in place by the soldered contacts). Using the same sata connector mounted to the old ide posts, there are connectors (a plug if you will) that can plug in the back of it. This isn't loose, if anything it is more stable. I am using it for mine so I don't have to bend pins or worry about current jumping. I can still swap without taking the computer apart. the thing i don't like about most of these SATA mods is that the drive pretty much becomes a permanent part of the machine, no easy removal as per the original design. and on the X41 the drive cage and the the way it clamps the IDE connector and system board to the case is a big part of the machine's rigidity i wasn't going to give up. because the actual board inside the kingston 2.5" SSD i used is tiny i had plenty of room to work out an adapter that would leave the IDE connector in place AND make the drive easily removable. this would be really easy to do on the T43 by using a 1.8" SSD. for the adapter you just need to source an IDE connector from an old HDD and a SATA connector from some fried laptop, or get both new from some place like digikey. first pic is the adapter board being fitted before etching and the second is with everything soldered up. by removing the two screws the adapter can be unplugged from the original IDE connector. PMs requesting free beer shall be deleted! ZAGNUT wrote: What Zagnut said. Yeah, you did an excellent job. The sata mod can be made very sturdy with a little work. I am considering getting another machine to do your mod to but this one is going to get the sata mod, I'm all set up for it now. c4warrior wrote: Using the same sata connector mounted to the old ide posts, there are connectors (a plug if you will) that can plug in the back of it. This isn't loose, if anything it is more stable. I am using it for mine so I don't have to bend pins or worry about current jumping. I can still swap without taking the computer apart. I have a HP DV6700 laptop here which uses this exact SATA connector. The connector is pushed into the hard disk SATA port, then you slide in and push down that HD with connector into the matching 'receptacle' in the HD bay. Using that very 'receptacle' would not be possible in a T43, there is no room for it. Spring break. I'm doing it on Tuesday. Nothing fancy but it's humming along. Put my 780 proc in and my 500gb sata drive. The shims on the back of the interface are too fragile to use the connectors on the back so I just went with the soldering method. I also just cut the lines from the IDE and pulled the top interface off, used the bottom as my spacer. Everything is great... though I seem to have a weird black rubber piece that belongs in the machine somewhere... for the life of me I have no recollection of what it is. That black piece might be the one that goes in the top-left corner around the microphone. The 'legs' would both point to the left when you mount it. RealBlackStuff wrote: That black piece might be the one that goes in the top-left corner around the microphone. Hey, that's it. Thanks. I could not for the life of me find it on the pdf schematics nor could I recall taking it off. Must have just fallen off when I took out the board. Also, do you find that adapter to be loose at all? This may not make much sense but... when I put in the screw from the bottom that goes in to the black piece that comes off of the metal cover for the slimbay, the black piece that goes over the two terminals we used to mount the adapter, it disconnects the drive every time. If I leave that screw out I can move it around with no problems. I thought that either I had left the adapter loose or that I had mounted it wrong so I've checked it and checked it again, nothing. It's nice and firmly mounted. Not that it exactly hurts to leave the screw out but it will bug me until I put it back in. There's only one Ground coming from the mobo to the connector. Your SATA connector has quite a few more, why not try and connect them all together? That may help, let us know. Some drives of mine didn't work unless I grounded all three of the power grounds that match up with the 5V pins.